Some of our readers will know that between 1914 and 1920, Canada interned 8,579 innocent men, women and children as “enemy aliens.” Most of these internees were from the lands of the Austro-Hungarian Empire and were primarily ethnic Ukrainians. Activists and organizations from Canada’s Ukrainian community fought diligently to have the federal government acknowledge this dark chapter in the country’s history. By the time the federal government provided acknowledgement and funding for commemorative and educational projects on internment, the last known survivor of Canada’s internment camps had died. One such internment camp was called Spirit Lake, located near the town of Amos, in northern Québec. Nearly a decade ago, I had the chance to visit the former camp’s cemetery, all but reclaimed by the forest, where 16 internees were buried. It was both a moving and a disturbing experience. Already 10 years ago, the cemetery was close to being lost. Visiting the Spirit Lake Cemetery in September 2008. 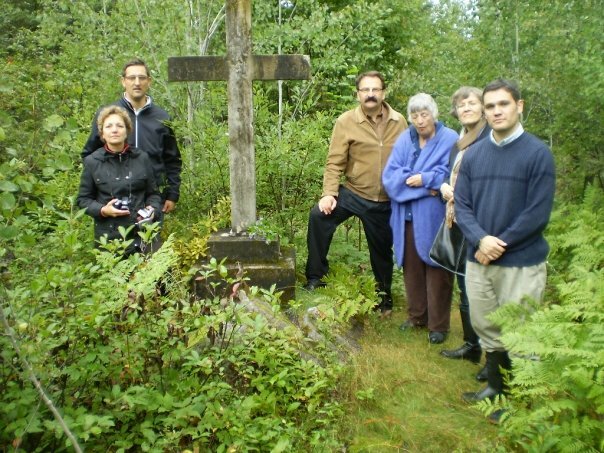 Federal officials, repeatedly informed about the deterioration of the cemetery, claim this is Quebec’s problem, abrogating all legal and moral responsibility for a cemetery established under federal authority and for the remains of the unfortunates buried there. Excellent initiative. Congrats to James Bezan, and to Mr. Adam for bringing this timely and noble step to our attention. May the petition result in appropriate action. Those people were interned on what grounds? In WWI, they were actually immigrants from allied country. As Ukraine was part of Russia. US interned west-cost Japanese in WWII as they feared that might collaborate with the advancing Japanese Military operations. Yet, they were all loyal American citizens. The young military aged men volunteered for military service and fought bravely in the war. As matter of fact, they were the most decorated military unit in the US armed forces in WWII. The 441 US Army regiment. Later the government compensated the internees. Since the land was sold, or granted to others, without any stipulation or regard to the cemetery, the remains need to be relocated. Honor the memory and the remains, not the location or the land ! Bendeguz, at this time, not all ethnic Ukrainians lived in the part of Ukraine that was in the Russian Empire. A significant number lived in the Austro-Hungarian Empire, mainly in the Kingdom of Hungary and in Galicia, so the Canadian government at the time would consider them to be “aliens” from an “enemy” state. May we suppose that any country that accepts people as immigrant, considers the “citizenship” of those,as of what country they come from, rather than their possible ethnic origin? So did Canada accepted them as citizens of the country they came from, not who their ancestors might have been? Is it not how it is to this very day, and by all nations ? P.S. Galicia was conquered territory by Austria. Thus it was only part of the dual empire, not Hungarian inhabited lands. But do you remember, where Hungarians have originated from ? This is a commendable initiative. The victims deserve a proper resting place that is cared for. More information about Canada’s first national internment operations can be found under Sources & Issues at the website of the Ukrainian Canadian Civil Liberties Association (www.uccla.ca). Thanks to Dr C Adam for helping to promote this petition in the Hungarian Canadian community. He was a valued member of the Endowment Council of the Canadian First World War Internment Recognition Fund (www.internmentcanada.ca). Working together we can ensure that this cemetery is restored and reconsecrated, so hallowing the remains of the innocent victims. Thank you to all those in the Ukrainian community who fought for historical justice! These crimes committed against innocent people cannot be forgotten.